"A few cracks are starting to show in Apple's iCloud. 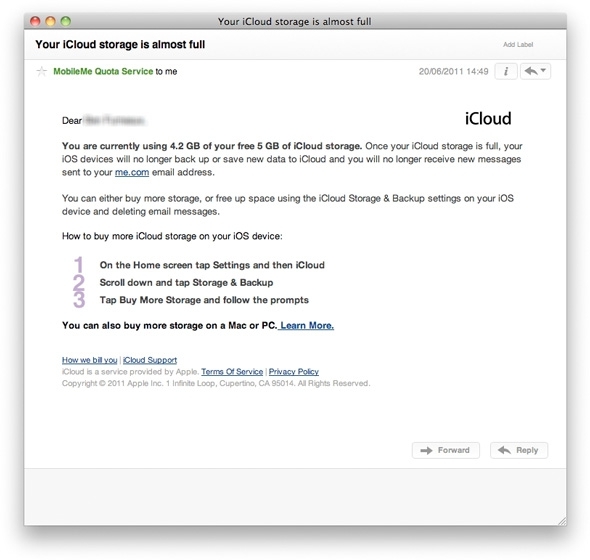 MacRumors says that if you use all your cloud storage space, you'll actually stop getting email. This isn't to say that you'll receive the emails once you clear up space -- the emails will actually be returned to sender and you'll never know they were sent." I don't quite get the intent of this article. No, the sky is not falling. Gee, bounced emails. It shouldn't be a big surprise that full really means full. Most email users know that disk space must be managed, whether it's Exchange email, or Gmail, or Lotus Notes, or Mac Mail, or xyz Mail. You run out of space, and it's your responsibility to clean up. Nobody likes space quotas, but, you fill it up, you either clean up, or buy more space. Why expect anything different even though the resource is in the cloud and not in a local server room?